As August approaches, it’s hitting me I have one month left before Fall term starts up again. Even though I haven’t posted as regularly as I wanted to this summer, I have been busy diving into the social media world. I now know this is where I want my focus to be as I wrap up my degree. Hope you enjoy the infographic. Happy Wednesday! 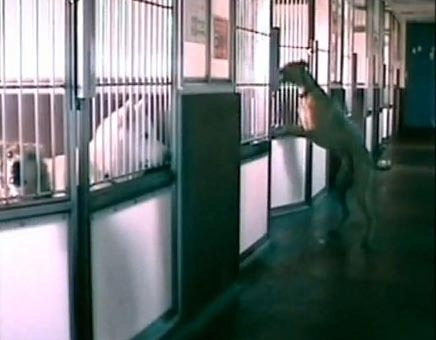 For this week’s mid-week break – here’s a great dog break out video! Watch it turn into a party. Happy Wednesday!! My latest “dive” into social media has been with Instagram. So here’s the big picture on it. It is a mobile application, owned by Facebook, that allows users to take photographs, apply different filters for different effects to the images and share them instantly. For the month of June, I participated in a photo-a-day challenge. The challenge wasn’t through Instagram but I used it as my method to share my photos. Each day was assigned a subject that I needed to take a picture of. I decided to fill each day’s subject with my favorite models, my dogs. Also, you can see on the right I’ve added a section for my latest pictures to post. Instagram has a large active community developed for social sharing. One of the things I like about is, it isn’t too large. You can choose different people to follow and it’s easy to stay caught up. I follow some friends but also several people I don’t know. I thought they took interesting pictures and it has been fun to see what they post from time to time. I also follow several large name brands like Coca Cola, Patagonia, Sharpie and National Geographic. I have to admit, when I first started taking my pictures I messed up in the setting and my photos were private. As the first week passed of my photo-a-day challenge I was a little disappointed no one started following me. The only comments I received were from friends on Facebook as I manually shared them there. I soon figured out what the problem was as well as how to post directly from Instagram to Facebook. It wasn’t long before I got a few notifications I had followers. It excited me and made me feel accepted in the Instagram “cool” crowd. But how did they find me? My guess is they participated in the same photo challenge I did. When you post pictures you can tag them with a hashtag (#). Searches can be done for any subject you can think of, in my case #photoadayjune. Since my pictures were of my dogs, I also could have used #dogs, #goldenretriever, #dogphotos, etc. but I just kept with the one, #photoadayjune. Post your own photos and videos. Very simple and from what I can tell people follow them. Marketers can use Instagram to appeal to consumers with similar interests. I found some great success stores but I kept it simple today. Maybe I’ll go into that detail another date., along with the new video option on Instagram and Vine. Dog TV – Why didn’t I think of this??? Well I actually did but just didn’t do anything with it…but isn’t that always how it is??? Here’s the story of my missed opportunity. Eleven years ago I adopted my Tipper. Look at those longs legs. She had a lot of growing to do and a lot of energy!!! While I was at work I would leave the TV on to keep her awake. She didn’t have separation issues, I just didn’t want her to sleep the whole day while I was at work, leaving all that bottled up energy for me to tend with when I got home. After all, a single mom needs a little help. She’s always been one to watch TV. 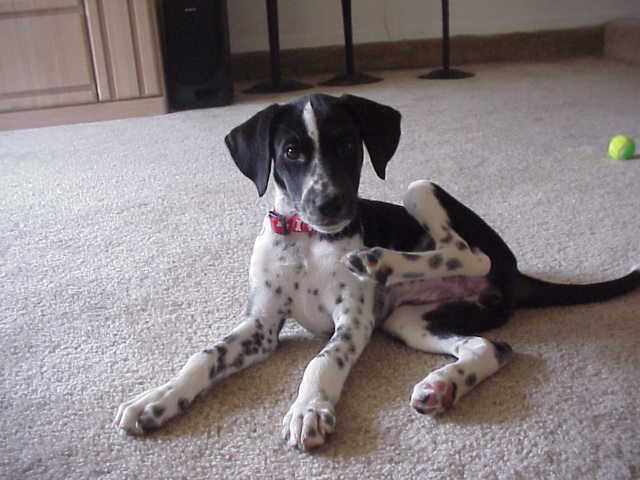 Here she is as a teenage pup watching the Westminster Dog Show. To this day when I leave the house I turn on the TV…I’m embarrassed to say “their TV”. We’ve gone from the Animal Planet, to the Cartoon Network and now our preference is NBC. But now there’s a channel just for her… Dog TV. 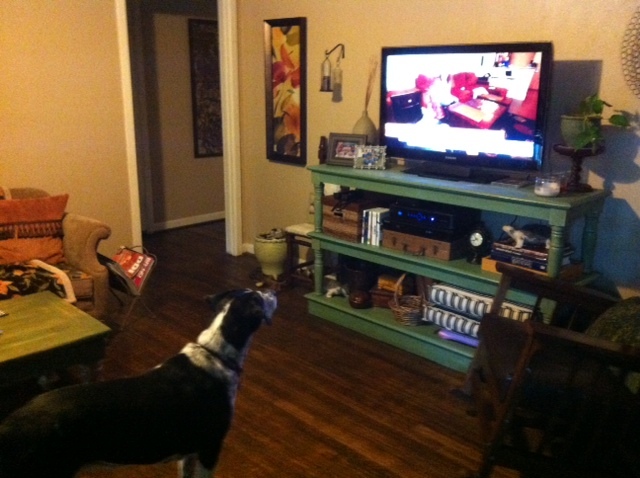 Here’s her reaction today, when they announced on the Today Show – the new channel just for dogs, Dog TV. 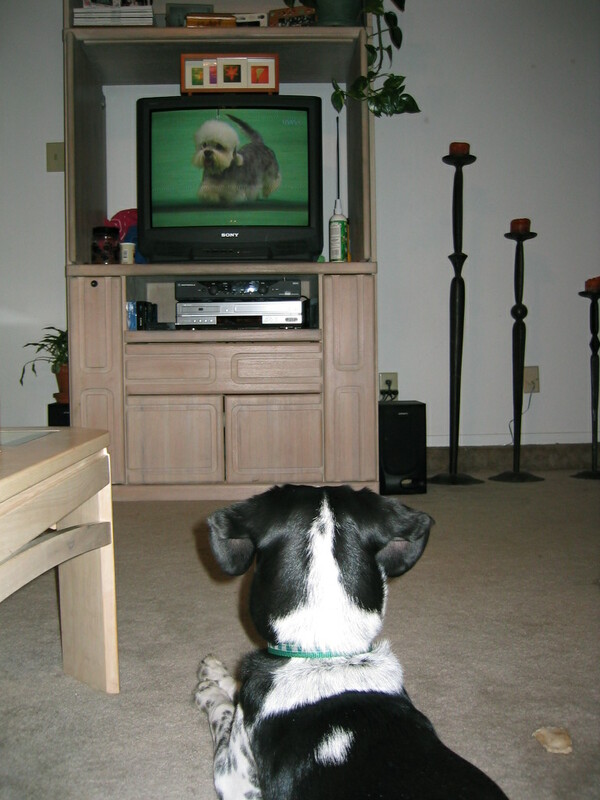 Dog TV was created to provide mental stimulation and as I had done 11 years ago, help prevent boredom. The channel has programming broken into 3-6 minutes segments focusing on relaxation, stimulation and behavior improving segments. For more information go to DogTV. Grandma Marmi… this might be on Tipper’s Christmas list this year.